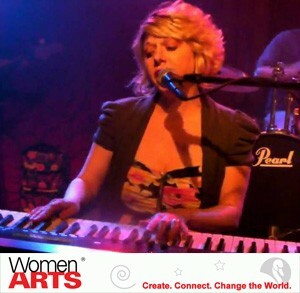 Photo Credit: WomenArts.org ~ Jennifer Hill performing SWAN Day CT.
WomenArts is now accepting submissions for the second annual SWAN Day Song Contest! We are looking for inspiring songs about women that can be sung at SWAN Day events and at other community gatherings. If you have written a great song that fits the Women Arts guidelines below, please send it in! The top prize is $1,000, the second prize is $500, and we will create other prizes depending on the entries we receive. The winning songs will be featured in the WomenArts Blog, newsletters and social media. about Support Women Artists Now Day/SWAN Day. We also will consider excellent original songs that directly address women’s issues (such as body image, reproductive rights, or equal pay) or songs about women addressing important social issues (such as racism, immigration, the environment, or peace). We occasionally give small awards to songs just because we love them, even if they do not fit our guidelines exactly. Style: We prefer songs that people can learn fairly quickly and sing together. If the song is not in English, please submit a translation of the lyrics and at least one verse in English. Copyrights: Artists will retain the copyrights to the songs but they will grant WomenArts a non-exclusive right to use the songs on the web and in our print materials. Please note that we can only accept original material where you (or you and your collaborators) own the rights to both the music and the lyrics of the song you submit. Submission Process: Please upload your song to YouTube, Vimeo, Facebook, your website, or some other online location, and then send us the link using our SWAN Song Submission Form. You can submit a maximum of two songs. You must use a separate submission form for each song. Deadline: Please submit your song by Monday, March 12, 2018. We plan to announce the winners during the week of SWAN Day. Prizes: We are offering a first prize of $1,000, a second prize of $500, and additional prizes depending on the entries we receive. All winners will be featured in the WomenArts Blog, newsletter, and social media. © WomenArts 2017 unless noted otherwise. All rights reserved.